Our main research area concerns understanding the fundamental properties of materials with a size in between individual molecules and macroscopic objects. These nanometer scale materials have physical characteristics that are strong functions of their size and shape, with properties that can be easily manipulated to address a given application. Our research interests are currently focused on fundamental photophysical studies of carbon nanotubes and semiconductor nanocrystal quantum dots, and the integration of these materials into novel integrated nano-molecular systems for photocatalysis, such as the conversion of solar energy into chemical fuels. These studies are highly interdisciplinary, and lie at the interface between chemistry, optics, physics, applied physics, and materials science. Carbon nanotubes consist of a hexagonal network of carbon atoms rolled up into a cylinder. Nanotubes are typically tens to hundreds of microns long, while their diameter is usually only around 1 nanometer. The quantum confinement of electrons around the nanotube results in unexpected properties. For example, carbon nanotubes can be either metallic or semiconducting, depending on the diameter and helicity of the carbon lattice. We are concerned with understanding fundamental electronic and optical characteristics of single carbon nanotubes, such as the physical nature of the nanotube photoexcited state, and exploring nanotubes for applications in photoinduced charge transfer. These investigations are carried out using atomic force microscopy, as well as single molecule and ultrafast optical spectroscopy (Figure 1). Figure 1. 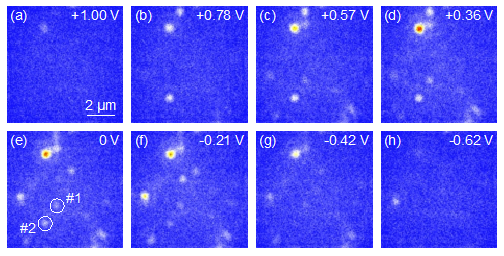 Images of fluorescence from individual carbon nanotubes under an applied electrochemical bias. Different nanotubes emit light at different applied potentials showing the strong influence of the local environment on nanotube optoelectronic properties. Inorganic semiconductor particles containing a few thousand atoms, known as semiconductor quantum dots (Figure 2) also have unique electronic and optical properties. Using state-of-the-art experimental techniques (electrostatic force microscopy and single molecule optical spectroscopy), we are investigating the optical emission characteristics of individual quantum dots and the effect of added charges on this emission. In addition to developing syntheses of new quantum dot materials, we are also studying the fundamental inorganic reaction mechanism that describes the initial formation of quantum dots from molecular precursors. A significant remaining challenge for materials chemistry is to connect nanometer-sized materials to the macroscopic world. To that end, we are also exploring integrated nano-systems that can take light and convert the energy into making chemical bonds. For example, solar energy can be converted to clean burning chemical fuels such as hydrogen using quantum dots as the light harvesting element. This work is done in collaboration with Professors Bren, Matson, and Eisenberg from the University of Rochester. Also, quantum dots can be used in combination with inorganic or organic small molecule catalysts to make unique carbon-carbon bonds that are valuable to the pharmaceutical industry for making drugs. This latter work is done in collaboration with Professor Dan Weix from the University of Wisconsin. A. R. Amori, J. E. Rossi, B. J. Landi, and T. D. Krauss, “Defects Enable Dark Exciton Photoluminescence in Single-Walled Carbon Nanotubes,” J. Phys. Chem. C 122, 3599-3607 (2018). Z. Hou and T. D. Krauss, “Photoluminescence Brightening of Isolated Single-Walled Carbon Nanotubes,” J. Phys. Chem. Lett. 8, 4954-4959 (2017). L. C. Frenette and T. D Krauss, “Uncovering Active Precursors in Colloidal CdSe Quantum Dot Synthesis,” Nature Comm., 8, 2082 (2017). J. A. Caputo, L. C. Frenette, N. Zhao, K. L. Sowers, T. D. Krauss, and D. J. Weix, “General and Efficient C-C Bond Forming Photoredox Catalysis With Semiconductor Quantum Dots,” J. Am. Chem. Soc. 39, 4250-4253 (2017). F. Qiu, Z. Han, J. J. Peterson, M. Y. Odoi, K. L. Sowers, and T. D. Krauss, “Photocatalytic Hydrogen Generation by CdSe/CdS Nanoparticles,” Nano Lett. 16, 5347-5352 (2016). S. Schäfer, N. M. Cogan, and T. D. Krauss, “Spectroscopic investigation of electrochemically charged individual (6,5) single walled carbon nanotubes,” Nano Lett. 14, 3138–3144 (2014). Z. Han, F. Qiu, R. Eisenberg, P. L. Holland, and T. D. Krauss, “Robust Photogeneration of H2 in Water Using Semiconductor Nanocrystals and a Nickel Catalyst,” Science 338 1321-3124 (2012). C. M Evans, M. Evans, and T. D. Krauss, " Mysteries of TOPSe Revealed: Insights into Quantum Dot Nucleation," J. Am. Chem. Soc. 132, 10973-10975 (2010). 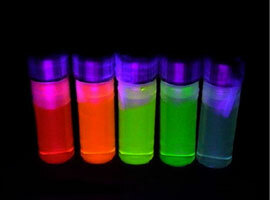 J. J. Peterson and T. D. Krauss, "Fluorescence Spectroscopy of Single Lead Sulfide Quantum Dots," Nano Lett. 6, 510-514 (2006). A. Hartschuh, H. N. Pedrosa, L. Novotny, and T. D. Krauss, "Simultaneous fluorescence and Raman scattering from single carbon nanotubes," Science 301, 1354-1356 (2003).